In this hands-on workshop, participants will learn how to use Fritzing to advance their electronic prototyping skills. Learn how you can document and collaborate on your project, how to create custom parts, and how to turn your breadboard circuit into a proper Arduino shield or other type of PCB. Participants are requested to bring their own laptops (latest softwares from www.fritzing.org & www.arduino.cc installed if possible). Arduino boards and bits to play with can be borrowed or bought on location but please do bring your own projects & bits for experimentation. The workshop is accompanied by Mikko Sivulainen (www.paeae.com) & Tuomo Tammenpää (www.misusage.org / www.yatta.fi) for assisting in Arduino & sensors related topics. No registration. We have 10 seats so be early. Some room to stand around for following in the backround. More info from tuomo ( at ) yatta.fi. 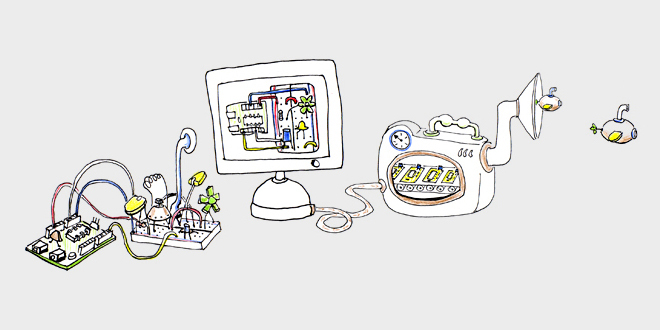 Fritzing is an open-source initiative to enable designers, artists, researchers and hobbyists to take the step from physical prototyping to actual product. We are creating this software in the spirit of Processing and Arduino, developing a tool that allows users to document their Arduino and other electronic-based prototypes, share them, learn from each other, and join the digital fabrication revolution by turning them into professional printed circuit boards.